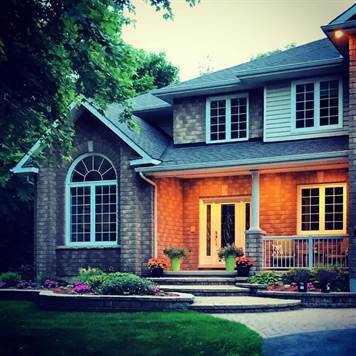 Welcome home to this extremely well maintained and updated custom built home, on a private premium 2 acre treed lot. No attention to detail has been missed in this 2-storey, 4 bedroom, 3 bath with open concept living, spa-like ensuite and master suite along with vaulted ceilings, palladium windows, bonus room over the over-sized triple garage, in-ground pool, basketball court and so much more! •	2018- Exterior French doors in eating area. Replaced all exterior vent covers and all indoor electrical outlets and all door hardware. Freshly painted throughout. Most lighting updated. Hardwood on main floors refinished and restained. •	2017- New roof and vents. Updated kitchen appliances. •	2016-17- All palladium windows replaced. Ensuite bathroom updated. •	2015- Pool pump and sand filter. Granite and all new faucets added to kitchen and bathrooms. •	2014- Pool liner and pool heater. New garage doors and openers. New spiral hardwood staircase, railings and wrought iron spindles and new hardwood treads and risers to stairs for bonus room. Hardwood in all bedrooms, 2nd floor hallway and bonus room. •	2012- Hot water tank. •	2001- Irrigation system. New paved driveway and basketball court installed. •	2000-Water softener, HRV, humidifier, A/C and pool. Hydro $250/m avg. Gas$129/m avg. Carleton security $28/m. Shaw cable provider. Bell internet. Garage doors 18.4R value, garage insulated & drywalled & has upper storage area.